Imagine a hand-wrought John James Audubon illustration of a colorful bird in nature composed with the sensibility of artist Edward Gorey. The image that most likely comes to mind is of a realistic yet distorted, somewhat allegorical polychrome print of a bird. This image comes close to the large-scale color woodblock prints composed by artist Lyell Castonguay. To say the least, his work is reminiscent of Audubon and Gorey, but singularly his own. Lyell earned a degree in illustration at the New Hampshire Institute of Art in 2010. The Newmarket-based artist then furthered his woodblock artistry while working for a print studio in Western Massachusetts. There he developed his skills with a large-format press, which led him to purchase his own portable large-format press. Freed from the studio, Lyell used a van to travel with his press to art centers, galleries, museums, and anywhere else he could practice and share his skills. This naturally led to the creation of BIG INK, the name of his mobile workshop, with fellow NHIA artist and now life partner, Carand Burnet. The two Johnny Appleseeds of woodblock artistry routinely select up to 16 artists months in advance of each scheduled two-day BIG INK printmaking collaborative. This gives the guest artists time to create their own woodcut that they ﬁnish and print under the guidance of Lyell and Carand on the workshop days. Sizes can be as big as 40 by 96 inches. Each artist also donates one print to the BIG INK archive that now contains more than 200 works. 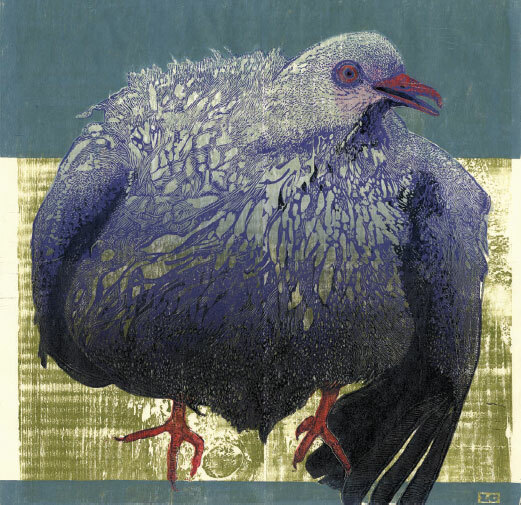 McGowan Fine Art is featuring Lyell’s bird prints alongside the works of other printmakers—Karen Dow, Sara Emerson, Mark Johnson, Judy Lampe, Nori Pepe, Vicki Tomayko, Sheri Tomek, and Bert Yarborough—in an exhibit titled Impressed. The show is free and open to the public. It begins on April 17 and runs through May 25. Lyell Castonguay and Carand Burnet will give a presentation about BIG INK that includes details about large-scale woodcut block printing and the workshop’s creative business model at the Capitol Center for the Arts on May 19 at 7:30pm.